Band of the Grenadier Guards (The). Musicien. Ens. instr. | Band of the Royal Marines (The). Musicien. Ens. instr. | Band of the Coldstream Guards (The). Musicien. Ens. instr. | Band of the Life Guards. Musicien. Ens. voc. & instr. | Band of the Royal Horse Guards. Musicien. Ens. instr. | Band of the Scots Guards. Musicien. Ens. instr. 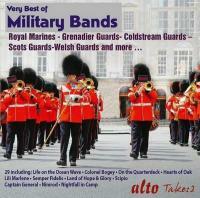 | Band of the Welsh Guards (The). Musicien. Ens. instr. A life on the ocean wave. Quick march : Captain General. Where'er you walk. Hearts of oak. Land of hope & glory / Cockaigne. Crimond & sunset. Salute for heroes / Rule Britannia. Quick march : Passing by. Crown imperial. Jerusalem. Royal flourish N°2 / Lead lindly light / Last post & nightfall in camp. On the quarter deck. Scipio. The thin red line. Grand march from Aida. Fehrbelliner reitermarsch. Lili Marlene. Birdcage walk. Thunderbirds. Colonel Bogey. Semper fidelis. The guns of Navarone. On Ilkley moor bahtat. Lincolnshire poacher. Blaydon races. Calling all workers. The floral dance. Eton boatin song. Nimrod / Nightfall in camp.